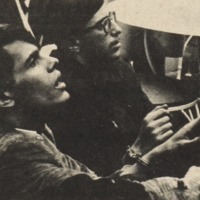 This is a 1964 photo of Columbia CORE members Louis Perez and Mike Flug demonstrating at the 1964 World's Fair right before they were arrested. The Columbia Spectator reported Perez had a tooth knocked out while being arrested.Both men were also arrested for a demonstration against Schaffer's Beer a month earlier. Victor J. Kayfetz, “photo of Louis Perez and Mike Flug, Columbia CORE,” corenyc.org, accessed April 18, 2019, http://www.corenyc.org/omeka/items/show/229.